The Seminar was held on 24 & 25 October 2007 at New Delhi. Inaugurated by Air Chief Marshal FH Major, PVSM, AVSM, SC, VM, ADC, Chief of the Air Staff, Indian Air Force. The Seminar attracted participation from the Ministry of Defence, the Indian Air Force, Industry – both domestic and international and think tanks from India. Key speakers at the Seminar include Marshal of the Indian Air Force Arjan Singh, DFC, Mr K P Singh, Secretary Defence Production, Ministry of Defence, Mr Baba Kalyani, Chairman and Managing Director, Bharat Forge Limited, Mr Atul Kirloskar, Chairman, CII National Committee on Defence and CMD, Kirloskar Oil Engines Limited, Air Cmde Jasjit Singh, AVSM, VrC, VM (Retd), Director, Centre for Air Power studies, Lt Gen SS Mehta, Director General, CII etc. The deliberations at the Seminar were focussed on trends in aerospace power, techno industrial issues, building industrial partnerships, energising aviation industrial partnerships etc. 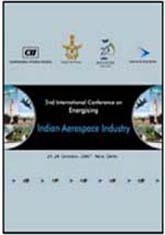 Major OEMs such as Boeing, Lockheed Martin, EADS, SAAB, HAL etc made presentations at this Seminar. Over 350 participants from India and abroad participated in the Seminar.